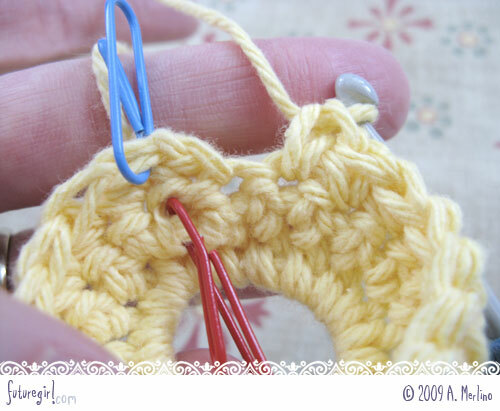 This way to do seamless single crochet is way-better than my original single crochet tutorial, especially if you're doing color changes. Why? 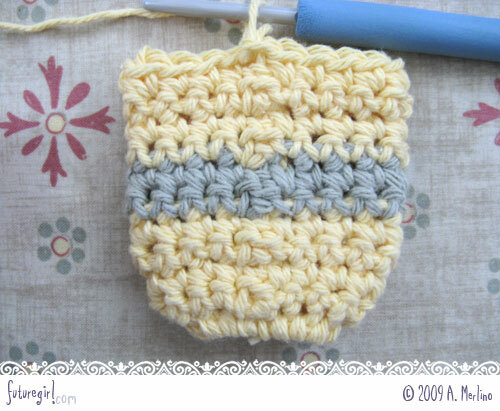 Because it's simpler, the color changes are cleaner looking, and there are no complicated stitch depths involved. I posted a comparison of the two techniques if you'd like to see the differences. Even a newbie will be able to follow this tutorial. · The blue thing on my hook is a hook cushion. I use them for comfort. Since they cover up the engraved hook size, I write it on the cushion with a sharpie. 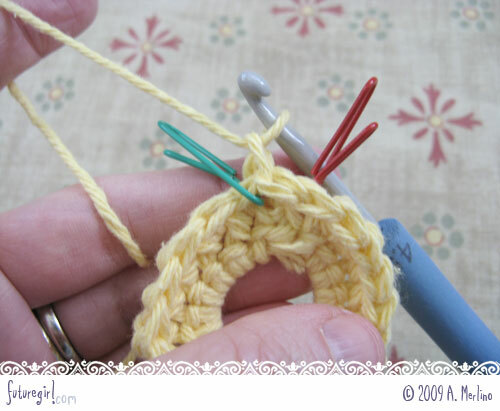 · My favorite hook is a 4.5mm hook, which I'm using in this tutorial. I've been using this one since the early 90's. It came in a set of crochet hooks I bought at the drug store. I recently discovered this was not a common US hook size when I went looking for a back-up and had trouble finding one. 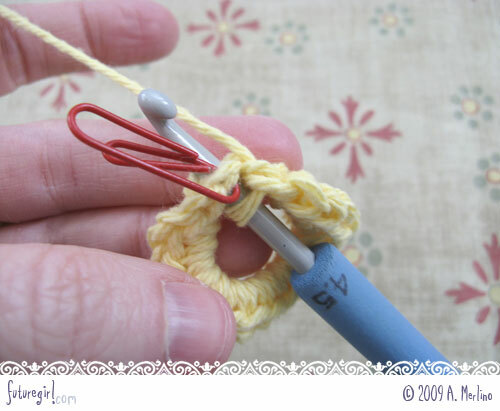 · I make my own paper clip stitch markers. 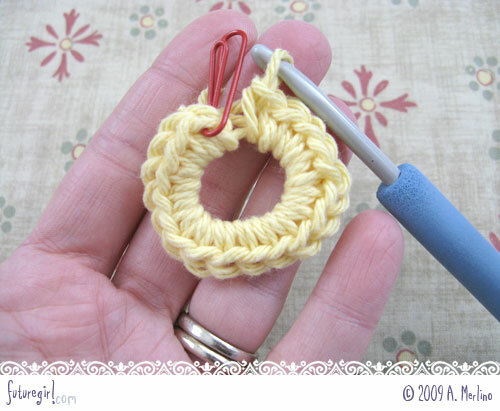 · I use TONS of stitch markers when I crochet. 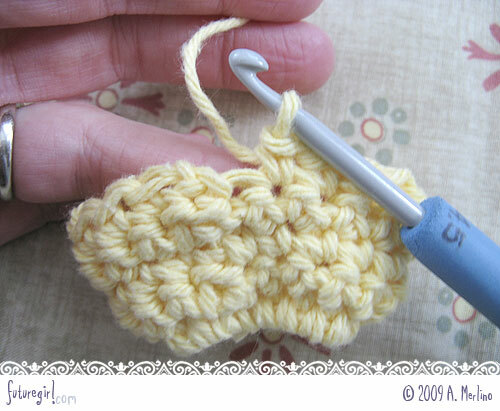 Whenever I need a visual cue, I use a stitch marker. 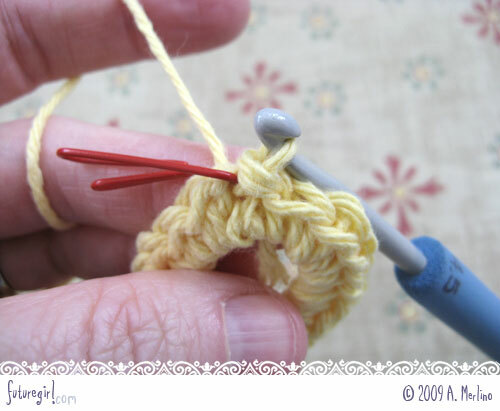 So, if while you're using this technique, you find that you can never figure out which stitch is the first one of the row (into which you will need to slip stitch), then mark it with a stitch marker. 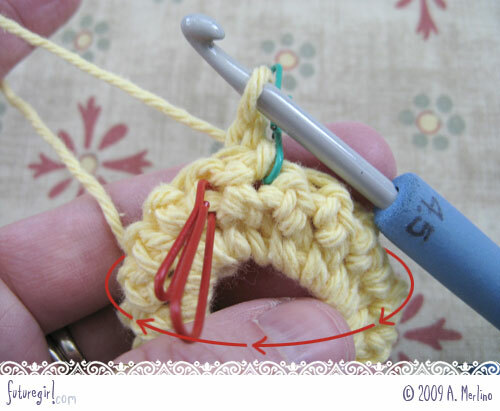 Or maybe you can't tell the slip stitch from the last stitch of the row after you turn, well then, mark the last stitch with a stitch marker. There's no shame in using stitch markers. Even after making dozens of my handbags, I still use stitch markers when I make them. The text is above its corresponding photo. 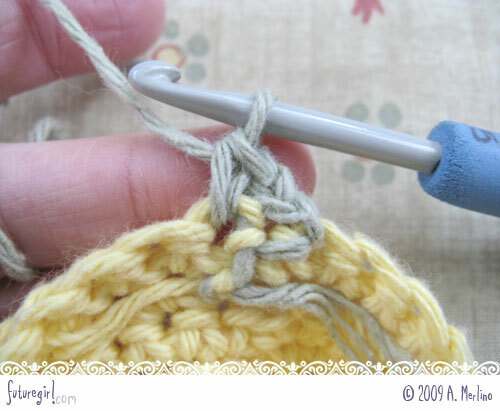 2) Now slip stitch to the first stich of the row (insert your hook into the top of the first stitch, yarn over, pull through all loops on your hook). The next two photos illustrate this step. 4) Turn. The photo shows the already turned piece. 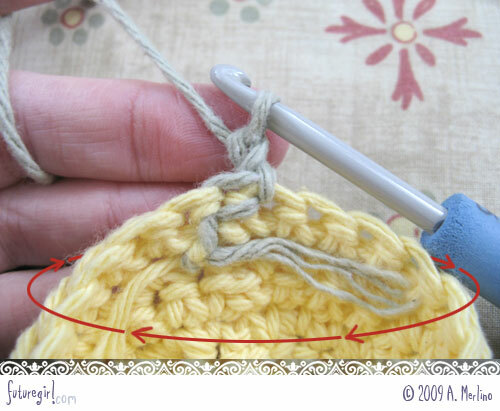 The arrows show you the direction you should always turn your piece when doing seamless single crochet. Turn so the right side passes toward you and becomes the left side. 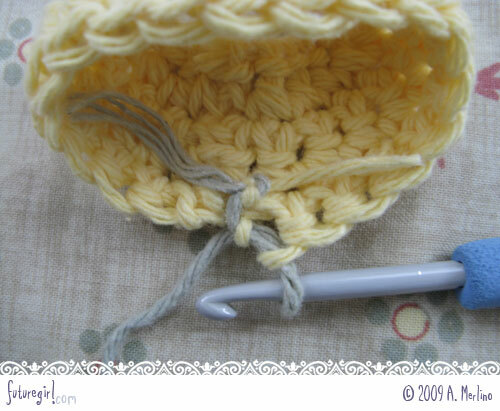 5) Make your next crochet stitch (which is the first stitch of this row) in the last stitch of the previous row. 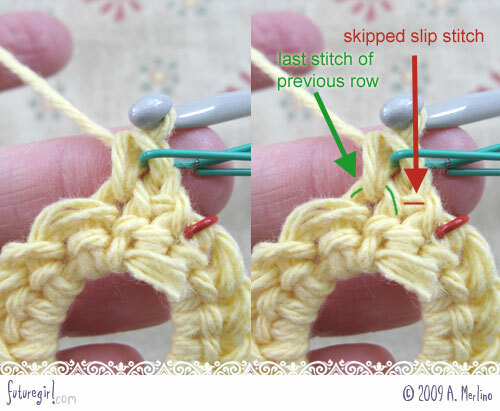 You will skip the slip stitch that completed the previous row. I marked the first stitch of the second row, which we just made, with a green paper clip stitch marker. 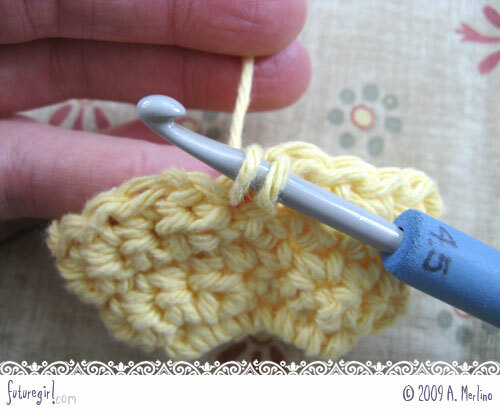 7) Slip stitch (put your hook in the stitch, yarn over, pull through all loops on your hook) to the first single crochet of the row (which is marked with a green paper clip stitch marker). 9) Turn. The photo shows the already turned piece. 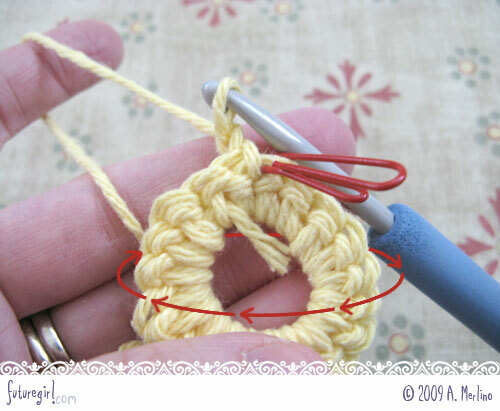 The arrows show you the direction you should always turn your piece when doing seamless single crochet. Turn so the right side passes toward you and becomes the left side. 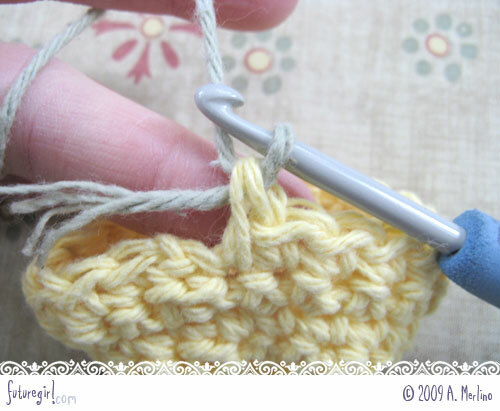 10) Skip the slip stitch that completed the previous row and single crochet in the next stitch, which is the last stitch of the previous row. 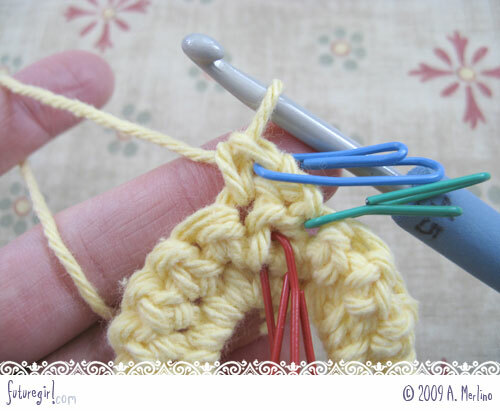 I marked the first stitch of this row with a blue paper clip stitch marker. 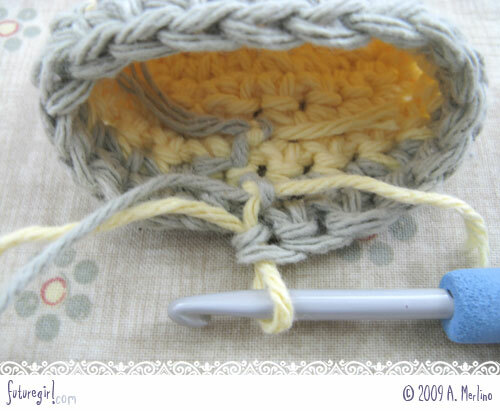 11) Single crochet around. 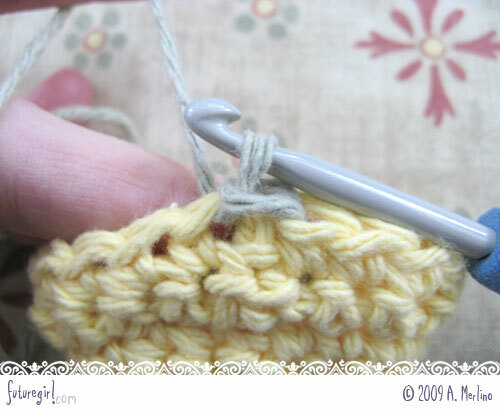 This image shows you the second to last crochet stitch of the row. 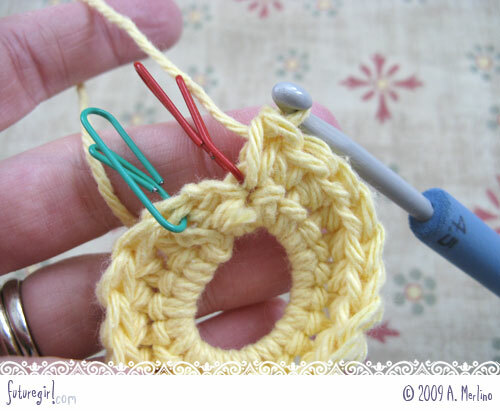 I wanted to show you that the place where you will make the next stitch, which will be the last stitch of the row, already has a vertical yarn coming out of it. 12) This is the last stitch of the row. Complete the row as you would in steps 2 through 4 or steps 7 though 9. Cake! 13) First, I want to show you what I mean by a two-row set. 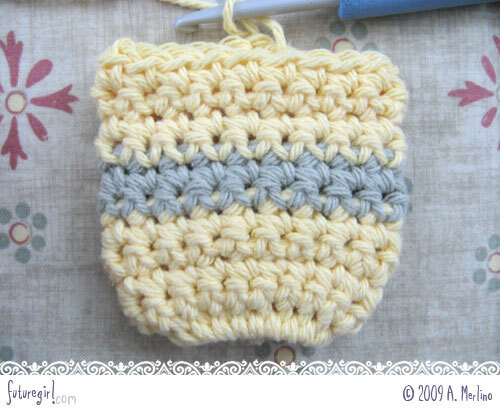 When you crochet your rows back and forth, they create a natural two-row set that look like a single row because there is a deep rut on top and bottom of it. I usually do my color changes in between these two-row sets. 14) Here we are at the end of a row where we've completed the second-to-last stitch of a two-row set. 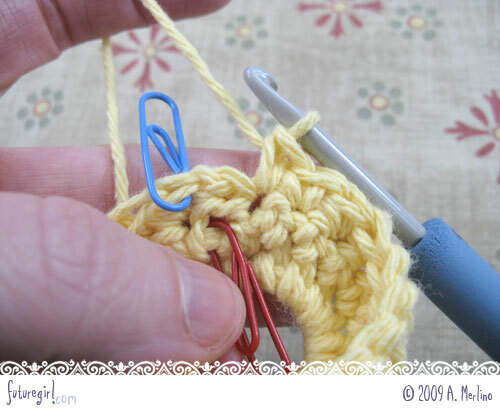 15) To complete the last stitch of the row, put your hook in the proper place in the previous row, yarn over, and pull through a loop. 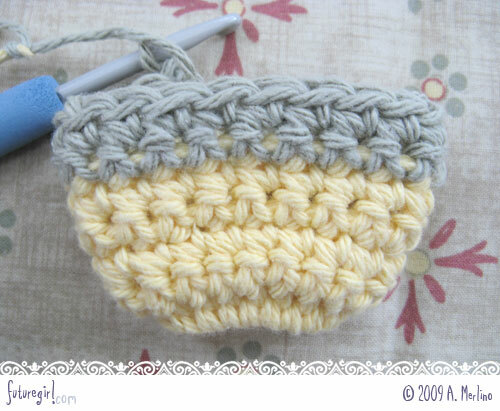 16) To complete the last stich, yarn over using the new color, and pull through both loops. 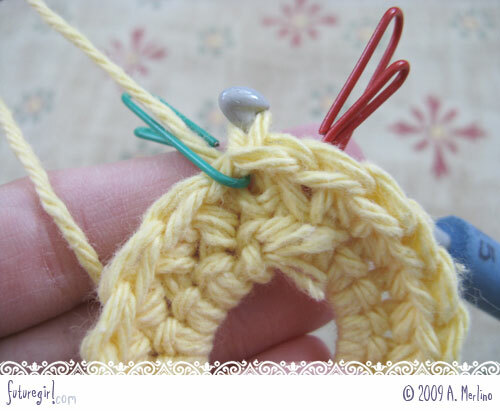 17) Tie the yarn ends in a square knot. Sometimes I do this at this point in the crocheting. Sometimes I leave them loose and tie them at the end when I'm weaving in all the ends. It doesn't really matter when you do it. 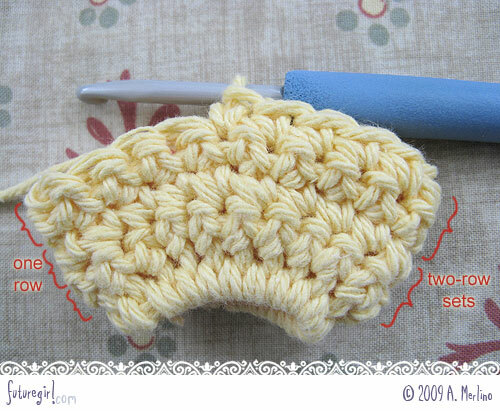 If you do it later, be sure to not pull the ends too tightly because it might make the stitches on the front look weird. 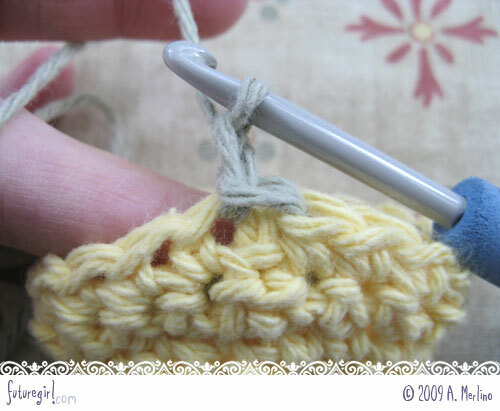 18) Slip stitch to the first single crochet of the row. 20) Turn. The photo shows the already turned piece with arrows indicating the direction in which the piece was turned. 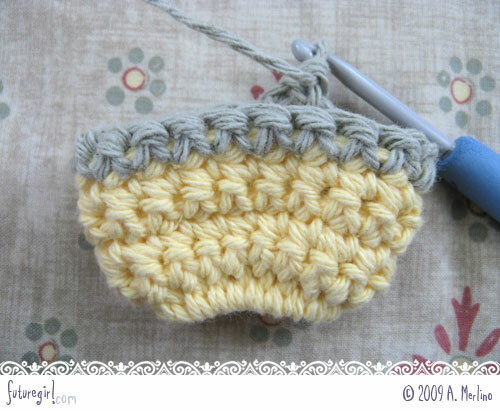 21) Skip the slip stitch that completed the previous row (which is sage-colored) and single crochet in the next stitch (which is yellow and is the last stitch of the previous row). Continue around. 22) Here is one row of the second color. 23) Here is a two-row set of the second color. 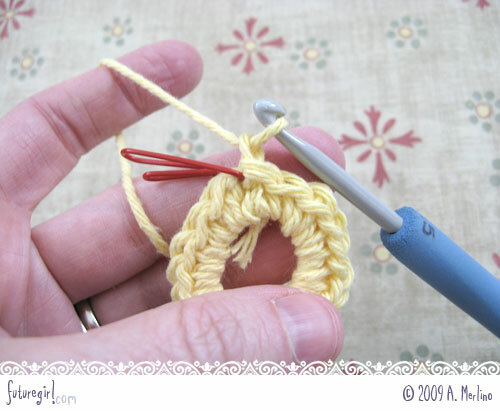 24) Here is the square knot when I switched back to yellow. 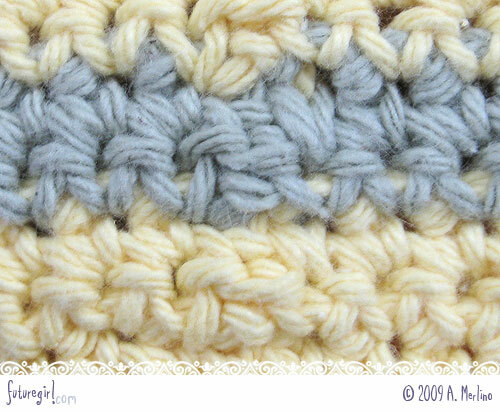 25) This is a shot of the "seam" in the seamless crochet. It's easily detected by an experienced eye, but I think most people wouldn't really see it. 27) This is the non-seam side, for comparison. As always, I'd love any feedback you have about this tutorial.